Browse and download Reading Groups teaching resources to use in your primary school classroom. A set of 4 colourful posters explaining reciprocal teaching roles. A set of 4 colourful reciprocal teaching role cards to assign to students during guided reading groups. A set of 20 puzzle cards for students to match pictures of toys to their definition. 8 reading detective worksheets to use during guided reading sessions in the classroom. 8 colourful reading detective name tags to assign students during guided reading sessions. A set of comprehension task cards to help students find the main idea when reading. A 144 page comprehension resource pack to help students apply comprehension strategies when reading. A set of comprehension task cards to help students distinguish between fact and opinion when reading. A set of comprehension task cards to help students recognise cause and effect when reading. A 16 page resource pack including 8 detective roles to assign to students during guided reading sessions. A set of comprehension task cards to help students summarise when reading. 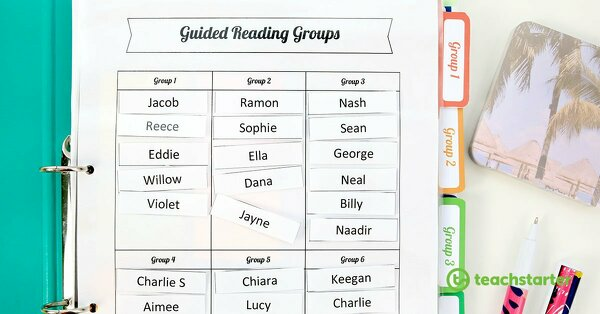 This guided reading folder is going to refresh the way you organise and run your guided reading sessions. This organisation brings dogs to school in order to help students to read. Sounds a little strange? Find out why Story Dogs is such a successful program for struggling readers.